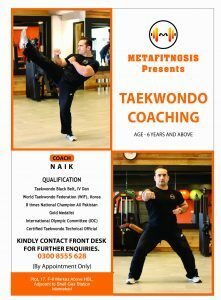 Metafitnosis presents Tae-Kwon-Do sessions with Coach Naik. His incredible qualifications include Tae-Kwon-Do black belt, IV Dan World Tawkwondo Federation (WIF), and 8 times National Champion All Pakistan Gold Medalist International Olympic Committee. He is also a Certified Taekwondo Technical Official. We offer Tae-Kwon-Do sessions for age 6 years and above. If you want to take a class, sign up now!